Vice Chancellor Prof. Paul Zeleza on Friday, February 22 signed a Memorandum of Understanding with the Chairman of the Council of Governors and Kakamega Governor Hon. Wycliffe Oparanya, that will document county experiences, good practices and service delivery at the county level. 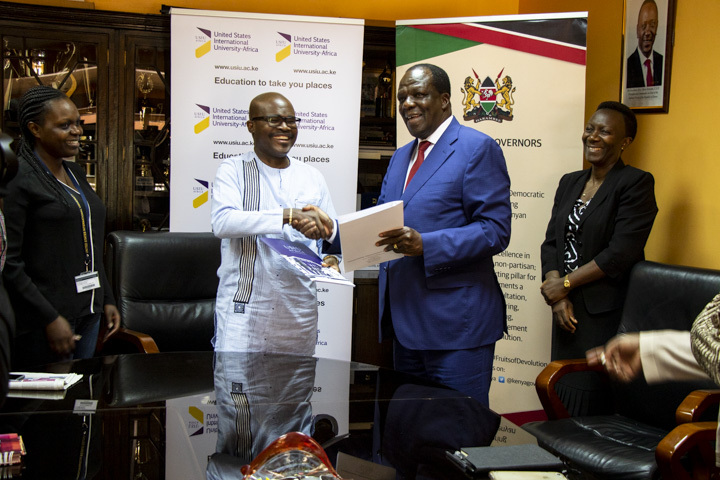 USIU-Africa is the first University to sign the MoU through with the Council of Governors with support from the World Bank will collaborate with Universities to document county solutions (innovations, best practices, initiatives that are transforming service delivery in counties). This collaboration will serve as a win-win initiative for connecting students and Universities to industry, by assigning students to document a number of county solutions and initiatives. USIU-Africa will undertake a Training of Trainers on knowledge capture methodology under the guidance of World Bank and the Maarifa Center which is a knowledge sharing and learning platform for capturing lessons and experiences on Kenya’s devolution from the 47 Counties. Speaking during the signing, Governor Oparanya touted devolution as a success despite numerous challenges. “These challenges continue to threaten devolution which is still very young. For it to work effectively, we need to prioritize financial growth, invest in human resources and urge the national government to fully support us,” he said. On his part, Prof. Zeleza pledged the University’s support in supporting Kenya’s devolution process by ensuring information at the county level is easily available. This initiative is part of the Council’s mandate under Section 20 of the Intergovernmental Relations Act (IGRA) 2012, which includes addressing issues of common interest to counties as well as sharing of information on performance of counties for the purpose of learning and promoting best practices. This agreement is unique in that it sets precedence for a structured collaborations between counties and the academia; ensures sustainability by integrating documentation of county solutions; engages students and faculty to document solutions that make devolution work; enables universities to understand research needs of counties; challenges universities to review their contribution towards realization of the objects of devolutions as outlined under Article 174 of the constitution and ensures effective management of youth in strengthening devolution. Initial priorities under the agreement include documenting experiences, innovations and good practices of counties in public participation, agriculture, health, public finance management, revenue generation and good practices in social risk management in counties. Initial priorities under the agreement include documenting experiences, innovations and good practices of counties in public participation, agriculture, health, public finance management, revenue generation and good practices in social risk management in counties.